Spyware: What Influences College Students to Use Anti-Spyware Tools? Spyware has become a major problem in businesses, schools, and homes today and is often discussed by reliable news and trade magazines. Significant research has been done on spyware and the damaging effects that it has on computers and people. With the wide range of information available for the public to obtain, why are there so many people who still do not protect their computers from spyware? To begin to answer these questions, we first reviewed several theories used to determine what factors influence people to perform a certain behavior. We examined the Theory of Planned Behavior and the Technology Acceptance Model. We decided to limit the scope of our paper to college students since this sample was more readily available to us than the general public. 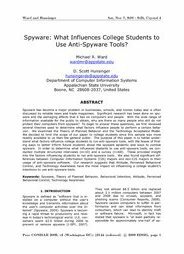 The purpose of this paper is to better understand what factors influence college students to run anti-spyware tools, with the hopes of finding ways to better inform future students about the spyware epidemic and ways to combat spyware. In order to determine what influences students to use anti-spyware tools, we conducted multiple structured interviews (n=10) and a survey (n=68). These provided insight into the factors influencing students to run anti-spyware tools. We also found significant differences between Computer Information Systems (CIS) majors and non-CIS majors in their usage of anti-spyware software. Our research suggests that Attitude, Perceived Behavioral Control, and Technology Awareness have the most impact on influencing a college student’s intentions to use anti-spyware tools.